Okay, the making isn’t the big thing. The blogging is. I’ve been working on learning book embellishment techniques outside of the simple blind tooling I’ve been using on the Egyptian Mamluk books I’ve made, and up until now I’ve been super shy about trying out some of the tougher stuff. The first reason is that I doubt my own skills (dumb, I know, but I think this is a natural thing for artists to do). I have skills, but they’re largely self-taught, as far as embellishment goes, with the exception of a couple of more construction-based things. Reason 2 is that these books are so intricately worked, and on such a small scale, that I find myself being frustrated by them. Sometimes all you need is a good kick in the pants. This particular kick has come in the form of a class I’m teaching next week on Islamic bookbinding embellishment techniques. I teach the construction part pretty regularly, but then I feel a little bad because my students are left with an embellish-able (not a word, but I’m using it like one) but completely plain book, which is not a thing you would have used in period. I have wanted to teach them how to finish the book and make it lovely, but haven’t had a way to do that. So I talked to a fellow bookbinder. She takes lots of classes from professionals, and I thought she’d be a good source of inspiration and ideas, and lo, she is that. These are three examples of very common embellishment techniques, sometimes used by themselves but often used in conjunction with each other. I’ve designed these in such a way that half the leather is glued down and the other half is loose, so when passed around a class, students can pull away the leather to see the underlying construction. I made these with my own pasteboard, which is the best thing ever (not bragging; make your own pasteboard and see how awesome it is to work with). The green sample is a simple blind-tooled design, which is something seen on both interiors and exteriors, either by itself or with one of the other embellishment styles (you can see on the mostly gold sample that it has a blind-tooled fillet around the edge of the center design). This particular motif is based on a Mughal binding in the collection of the Walter’s Art Museum in Baltimore. I have a feeling that these designs are partially cut into the leather, but I’m still too much of a weenie to do that, so I use a tool that presses the designs into the leather, which is pretty ok, too. Most Egyptian Mamluk books that I study use this technique, but with much more geometric designs. The brown sample at the bottom right is the next step from there, and consists of a thicker cover made of two pieces of board laminated to each other, with a cutout in the topmost piece. The board is glued and leather is pressed into the indentation. Then the leather in the indentation is tooled with floral designs. I think that in some cases there are also small pieces of board behind the floral shapes to give them a more raised profile, but this one is just tooled (and I’ve seen examples like this, as well). This was extremely satisfying, since my sample looks a lot like some of the extant examples I’ve seen, and I’ve been super-shy about working one of these. It was definitely a challenge. So worth it! The brown sample at the top right is a simplified version of something you see mostly on the interior covers of books, as it is very delicate. It’s a piece of leather backed with a piece of paper and then cut into lacy shapes with a sharp knife. This one is gilded (using gold gesso, since it dries quickly and is super cheap; not using shell gold for samples), but many examples are elaborately cut and tooled into animal and plant shapes. My current favorite is from the Timurid period, and features a center design of a monkey sitting on a tree. I have a long way to go before I get there. However, I do feel very happy that my theory about backing the leather before cutting appears to be sound. I had attempted doing it without backing before, and found that the leather moves too much. Paper is very helpful! After cutting, the design is glued to the base pasteboard, which has been either painted or gilded, so that a lovely color (generally lapis blue) or shiny gold shows through the cutwork. It’s beautiful, and very very time-intensive. That one piece took me as long as the other two combined. Anyway, if you want to hear more and see more photos of lovely things, come take my class on the Friday of Gulf Wars (gulfwars.org), and I’ll fill your brain with lovely ideas! 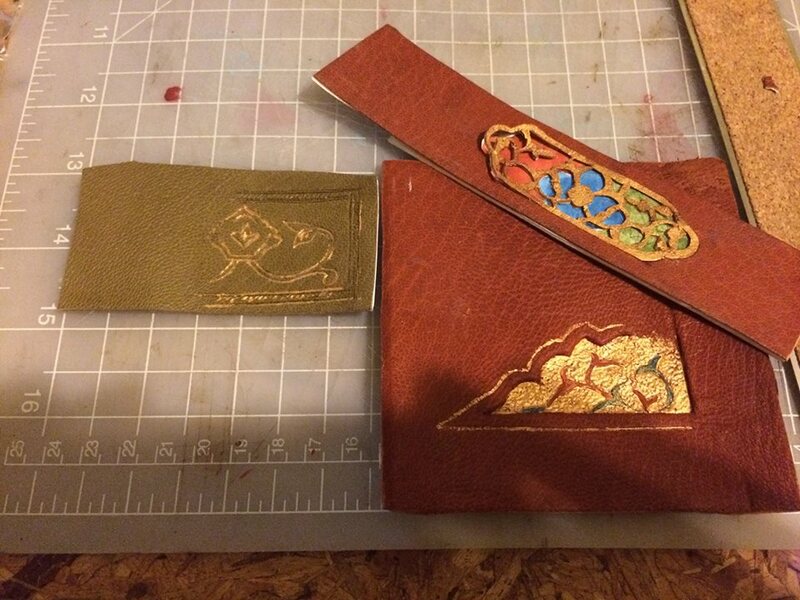 This entry was posted in General stuff and tagged bookbinding, crafts, embellishment, islamic bookbinding, leather tooling, sca. Bookmark the permalink.